When I used to subscribe to this magazine I knew exactly which potting mix was the best and which loppers to buy. I learnt the real story behind those so called perennial petunias the nurseries were always trying to sell me. Ha! A shame it's gone. So many new plants make such a lot of promises, and just don't quite deliver. It's sensible to be a little wary of claims of ten month flowering seasons, roses that are utterly and completely disease-free, and so on. Gardening results can be affected by the oddest things, too - you can't always blame the plant! In fact it's more often than not a simple matter of communication. In other words the gardener, super-wise, know-it-all, just didn't bother to read the label! 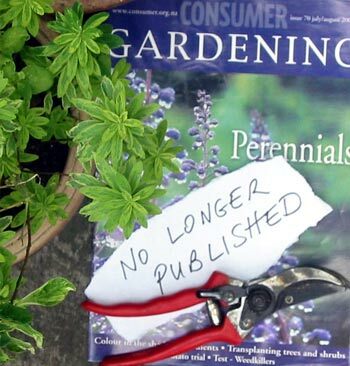 If you know of a good consumer garden magazine out there (which isn't trying to sell anything), please let me know.